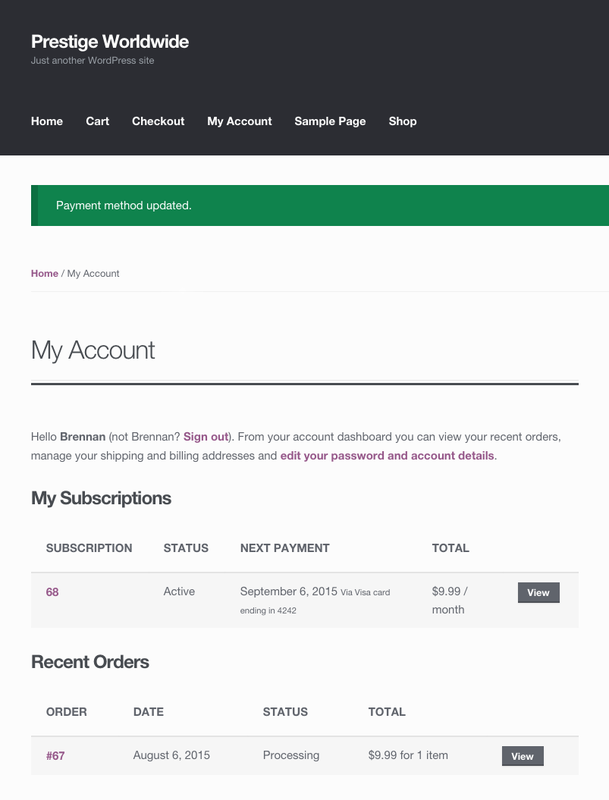 This guide provides an overview of functionality available to customers who purchase a subscription in your store via WooCommerce Subscriptions. For an overview of features for store managers, see the Subscriptions Store Manager Guide. If you have a question not answered here, check Subscriptions FAQ. After a customer has purchased one or more subscription products with your store, they can view details of their subscriptions on the My Account page. My Account is created by WooCommerce and gives a customer access to their billing and shipping addresses, order history and other account details. 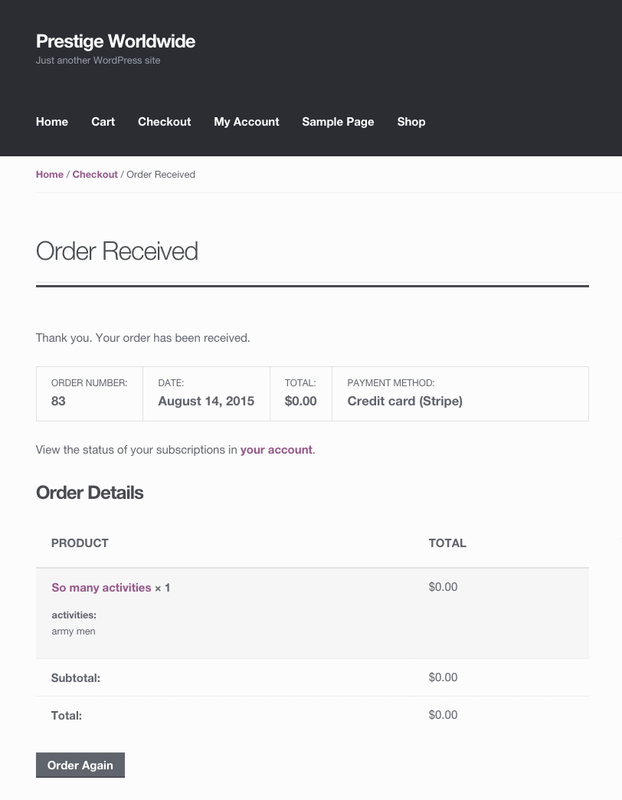 WooCommerce Subscriptions adds a My Subscriptions table to this page. In the My Subscriptions table, Subscriptions lists the ID for each customer’s subscriptions, along with subscription status, next payment date and links to My Account > View Subscription, where the customer can view all details of the subscription. Go to My Account page. Scroll to the My Subscriptions table. Click the subscription number under the Subscription column in the My Subscriptions table. Alongside each line item on the subscription, the customer can also Upgrade or downgrade that line item to a different but related subscription product. Want to remove a subscription action button? Check out the FAQ on removing a button from the View Subscription page. By default, both a Cancel and Suspend button is displayed next to each active subscription in the View Subscription page. If you do not wish to allow customers to suspend their subscription with your store so easily, you can disable customer suspensions in Subscription Settings. There is no setting to disable cancellation, but it can be disabled with custom code to remove the Cancel button from the View Subscription page. When a subscription has been put on-hold, either by you or the customer, a Reactivate button is displayed to allow the customer to restart their subscription. 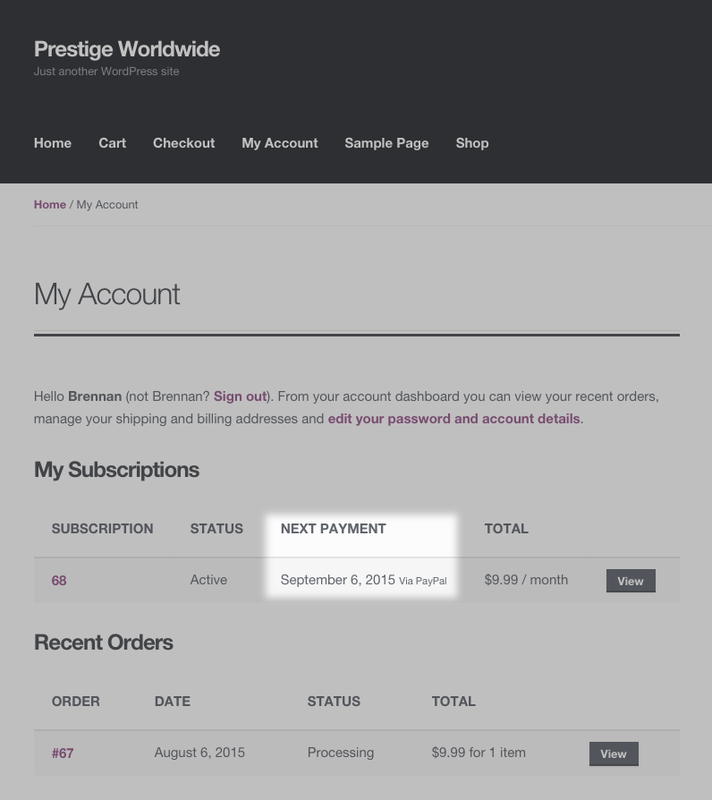 If the subscription was put on-hold because a payment is due, then the Reactivate button is not displayed. The customer must pay for the renewal before a subscription is reactivated. 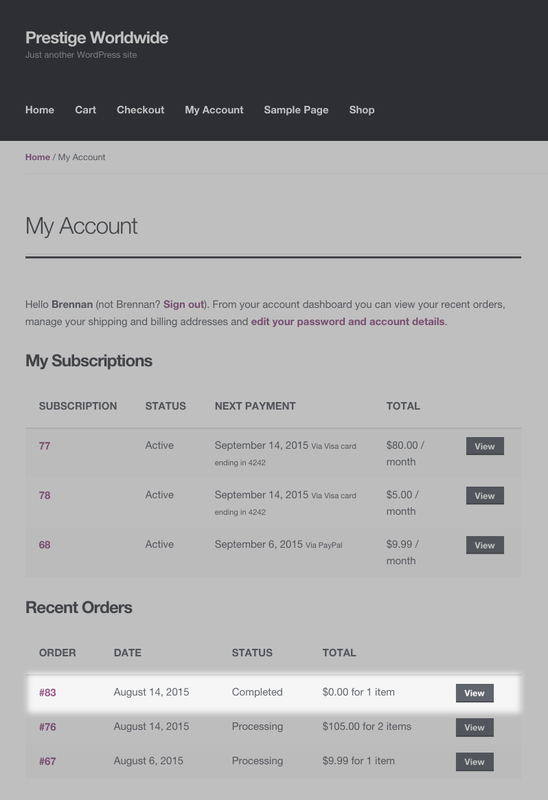 The buttons also only display if the payment gateway used to purchase the subscription supports the relevant action. Find out if your payment gateway supports these features at Subscription Payment Gateways. the payment gateway used to purchase the subscription must support subscription suspension. the subscription must currently have a status of active or pending. customer suspension is enabled in the Subscription Settings or is a store admin. current user must be set as the customer on the subscription. the payment gateway used to purchase the subscription must support subscription cancellation. the subscription must currently have a status other than cancelled, trash, expired, switched or pending-cancel. the subscription must have at least one future payment as there is no need to cancel a subscription that will end before any future payment is processed. If a subscription has more than one product line item, the customer can remove some or all but one of those items from the subscription. This allows customers to remove items they initially subscribed to but no longer wish to receive on each renewal. 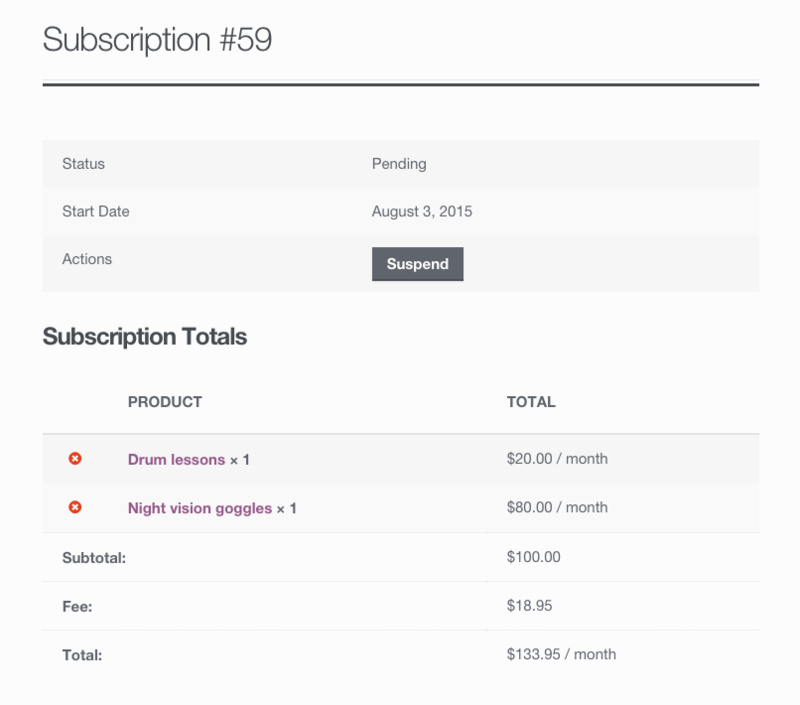 Select the View button next to the subscription they want to modify. Clicks the red cross next to the product they want to remove. Note: the red cross will only displayed when there is more than one product line item on the subscription. A customer can not remove all products from a subscription; they can only remove all but one. 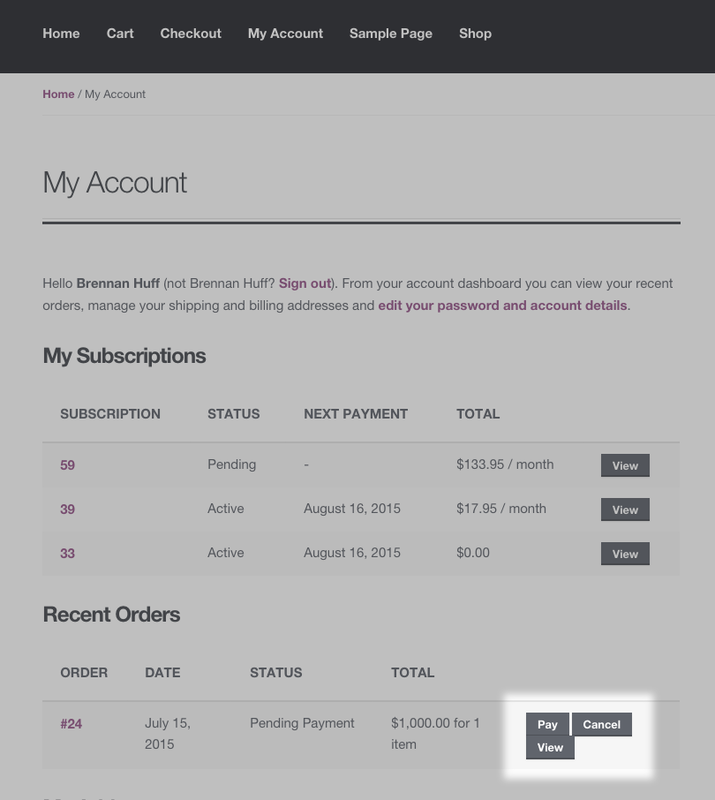 If payment is required on the renewal order for a subscription, a Pay button is also displayed next to the order under Recent Orders of both the My Account > View Subscription page and the My Account page. subscription is on hold or pending, as this also signifies the subscription has not been manually reactivated by a store manager despite payment not being collected for the renewal order. 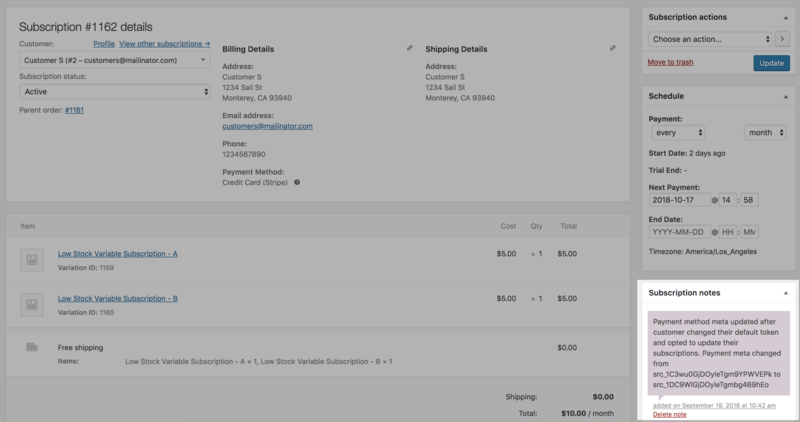 Clicking the Pay button in the subscription actions or order actions will direct the customer through a normal WooCommerce checkout process to pay for the subscription’s renewal. Once payment is completed for the renewal order, the subscription will be reactivated. If the payment is to make up for a automatic recurring payment that previously failed, Subscriptions will attempt to update the payment method on the subscription so that future recurring payments will use the new payment method rather than the failing payment method. However, this is only possible with payment gateways which support Recurring Payment Method Changes. If a subscriber wants to have their products shipped to a different address, or they move and need to update their billing address, they can change the addresses used for their subscriptions from the My Account page. Update the shipping and/or billing addresses for all subscriptions. Go to their My Account > View Subscription page. 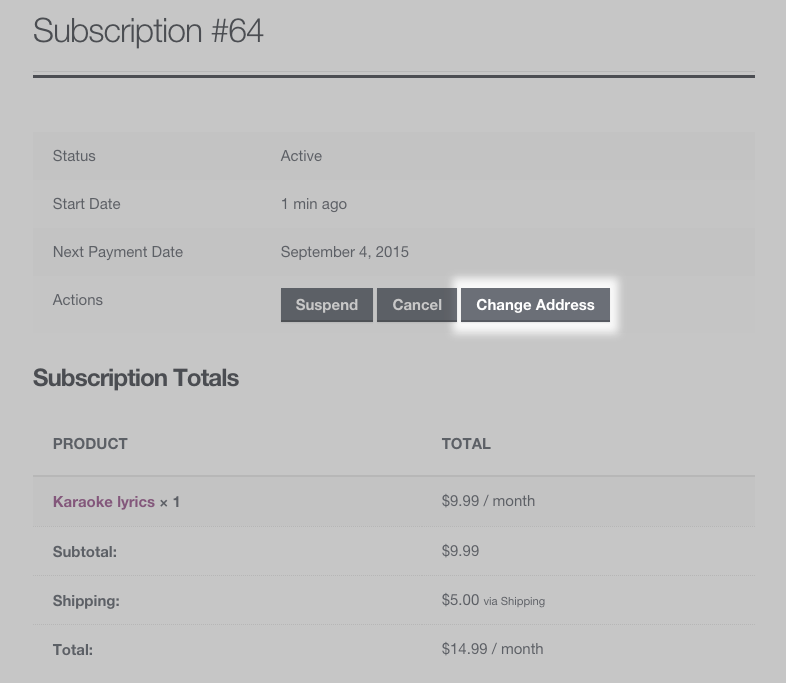 Click the Change Address button next to the subscription. Enter the new address details in the form. 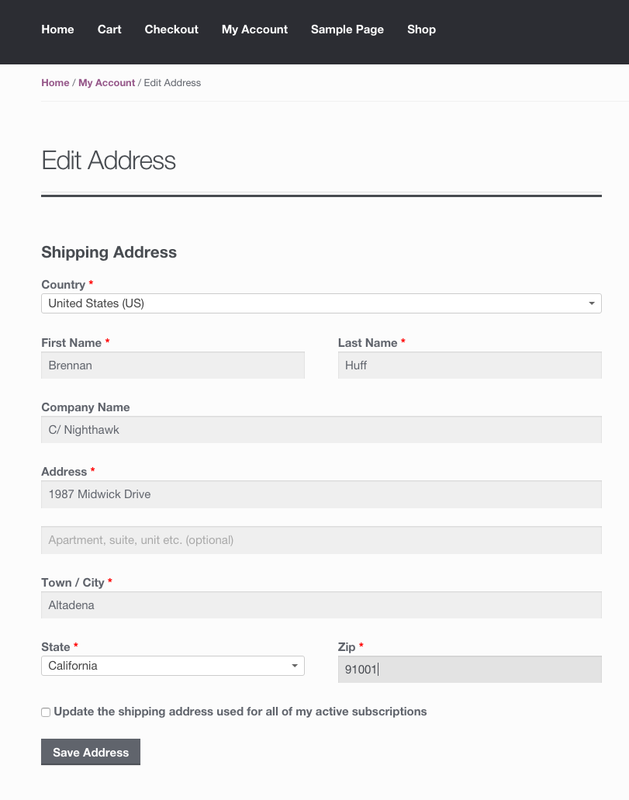 At the base of the edit address form, the customer is advised that both the shipping address used for this subscription and the default shipping address for future purchases are updated. However, the shipping address for other subscriptions is not changed. the subscription needs shipping – subscriptions to products set to be Virtual and/or that have a status other than Active or On-hold do not require shipping. Go to their My Account page. 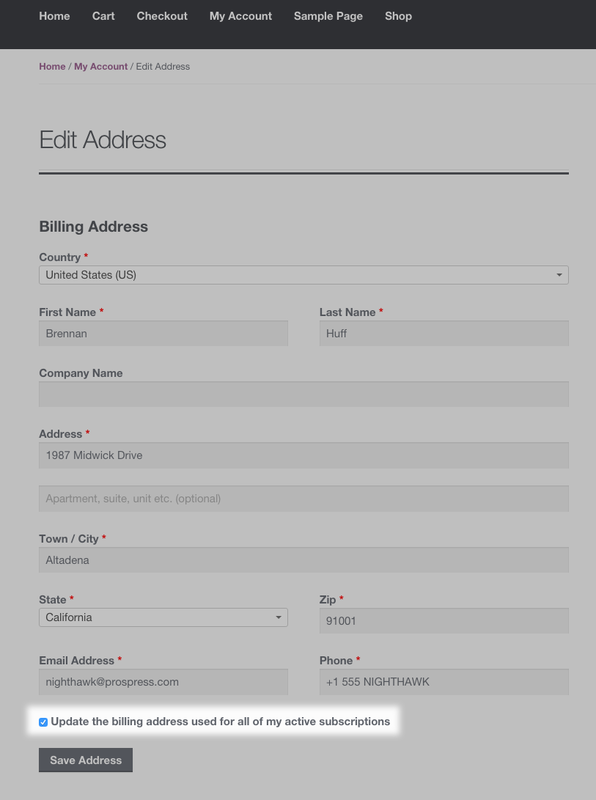 Select the Edit link next to the shipping or billing address. Tick the checkbox: Update the address used for all of my active subscriptions. The Change Payment Method button can be used update the payment method for future recurring payments, e.g., When a subscriber’s credit card expires, or they want to use a different credit card than the one currently on file. 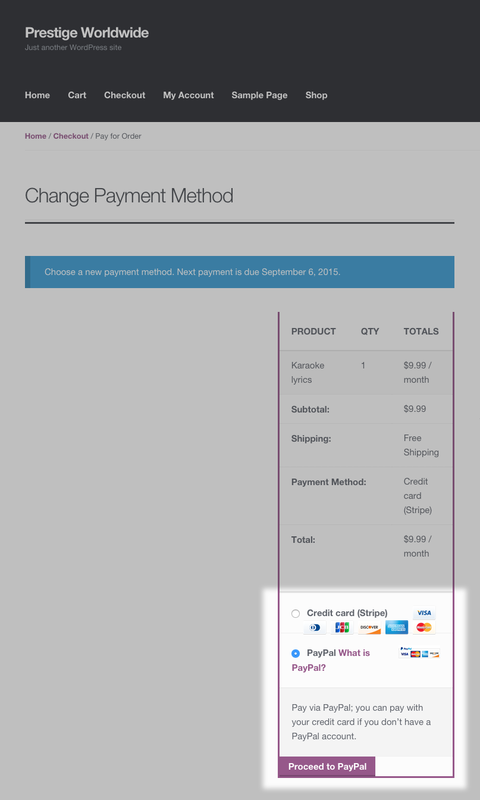 Select the Change Payment Method button next to a subscription. Enter the new payment details on the Checkout > Pay page. Submit the Checkout > Pay form and returns to the My Account page where a confirmation message says that the payment method has been updated. Requires automatic recurring payments. Changing a payment method for manual renewals is unnecessary as the customer can choose a payment method for each recurring payment. Site is not in Staging Mode. In Staging Mode all subscriptions are treated as requiring manual renewal to avoid duplicate payments. Has at least one future automatic payment scheduled. There is no need to change a payment method if no payments will occur. The site also needs to have at least one payment gateway enabled that supports payment method changes. If you allow switching between subscription products on your site, customers will be able to upgrade or downgrade between different subscription products via the View Subscription page. Selects the Upgrade or Downgrade button on the line item they want to switch. Selects a new subscription product and clicks Sign up Now. 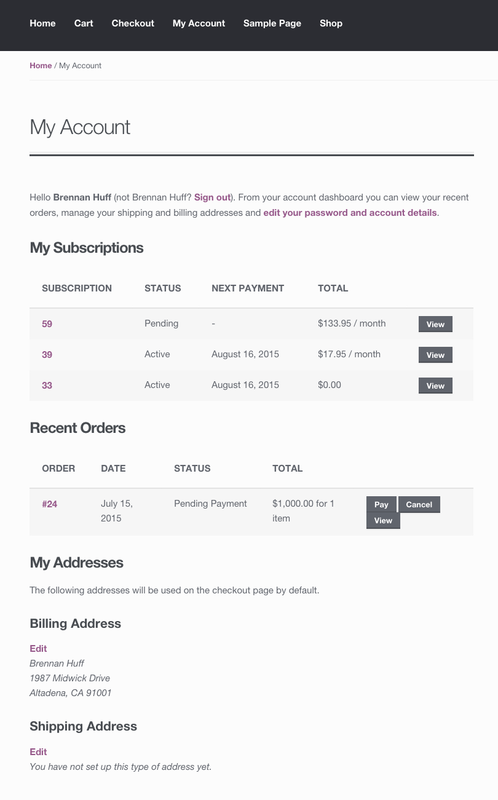 A checkout form is presented, along with a notice that this subscription will replace the existing subscription and the date the next payment will be charged. 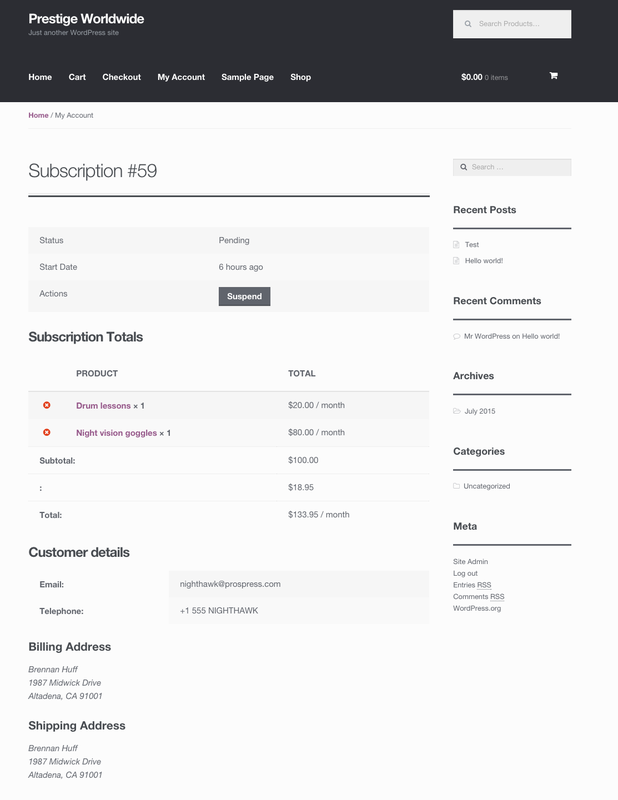 Completes the checkout form for the new subscription. 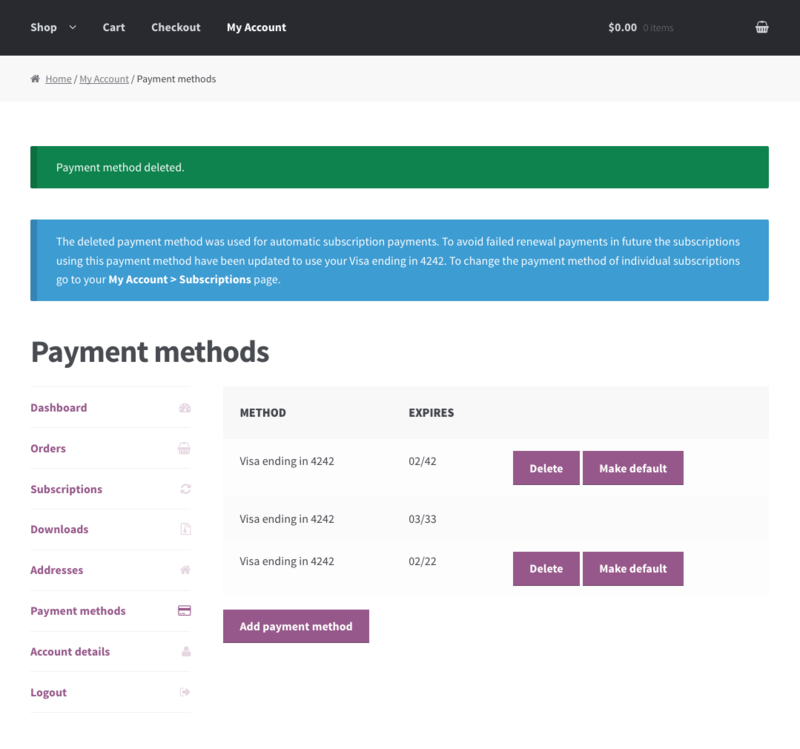 The standard Order Received page is presented, displaying details of up-front payment (if any) and recurring payments (if any). Is returned to the My Account page where they can see the line item on the subscription has been changed, and the recurring totals updated (if the amounts were different). Screenshots below show a customer switching from one subscription variation to another. If the Force secure checkout setting is enabled under WooCommerce > Settings > Checkout, the Force HTTP when leaving the checkout setting must be disabled. This is to ensure that the customer remains logged-in when viewing the product’s page to initiate the switch. 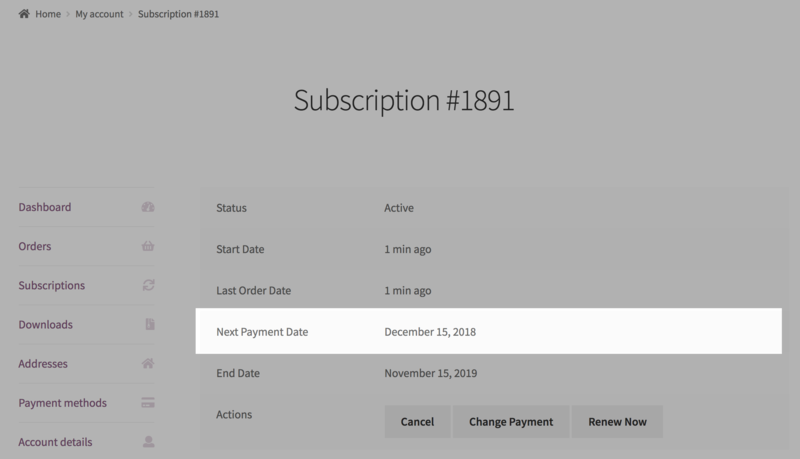 If a customer’s subscription has expired or been canceled, they can create a new subscription with the same terms as the original subscription by resubscribing to the inactive subscription from the My Account > View Subscription page. Clicking the Resubscribe button takes the customer through the normal WooCommerce checkout process to pay for the subscription’s renewal. Once paid, a new subscription s created with the same billing terms as the original subscription. Resubscribing to an expired or been canceled subscription has a number of differences to purchasing the same subscription product from the product page, like not charging a sign-up fee again. Behavior of the resubscribe process is explained in detail at Renewal Process Guide. Resubscribe makes it possible to offer existing customers a way to continue existing subscription terms, even after terms have changed. For example, the product’s price has increased for new customers. This is known as grandfathering. Resubscribe Process provides details on how customers are grandfathered. Gateways which support tokenization allow your customers to save information about their credit card or other payment methods. This can be used to communicate with the payment processor for future payments instead of requiring the customer to enter their credit card details again. 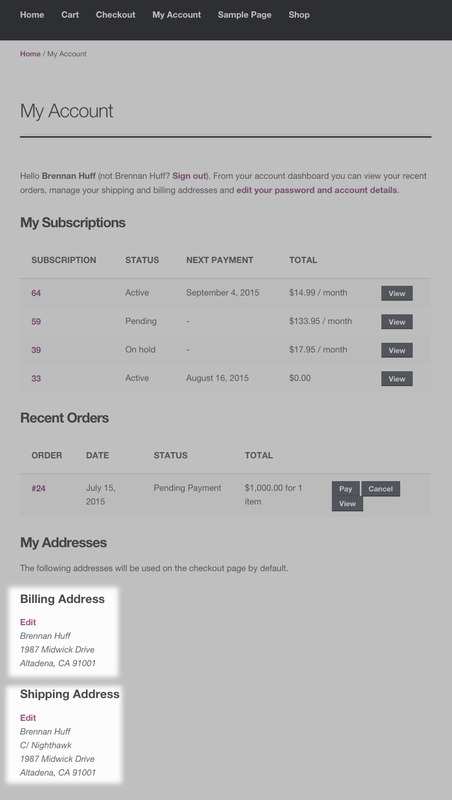 This is a feature of WooCommerce, not the Subscriptions extension. 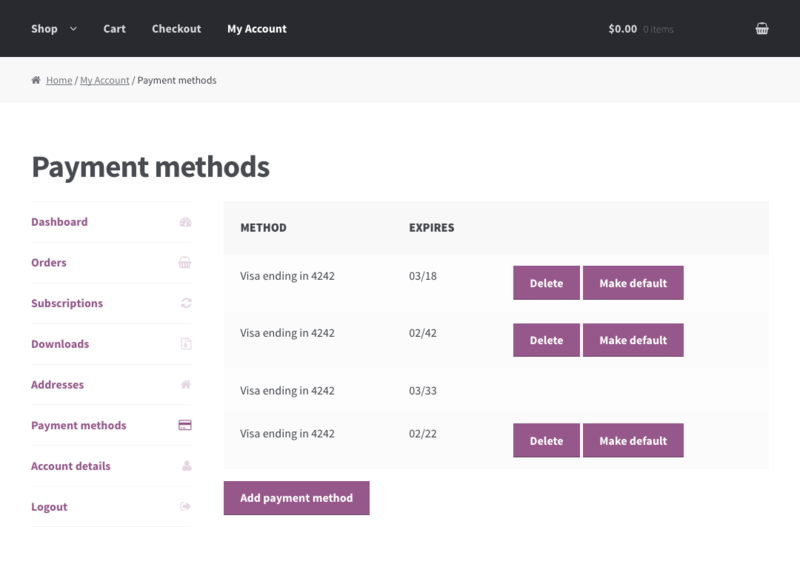 These payment methods are stored on the customer’s account in WooCommerce, not just a subscription. However, when used to signup for subscriptions, the payment token is copied to the subscription and stored there to be used to automatically process future renewal payments. As a result, Subscriptions needs to interact with WooCommerce’s payment method management to avoid tokens falling out of sync between a subscription and the customer’s account. Deleting a saved payment method which is used for subscription payments would cause future renewal payments to fail because the payment method can no longer be used. only has one other saved payment method and that can be used as an alternative for the subscription. If a customer’s account meets one of those criteria and deletes a payment method used by a subscription, the subscription will be automatically updated to use the alternative token when Subscriptions v2.2.7 or newer is installed. The customer will be notified of this after deleting the payment method. 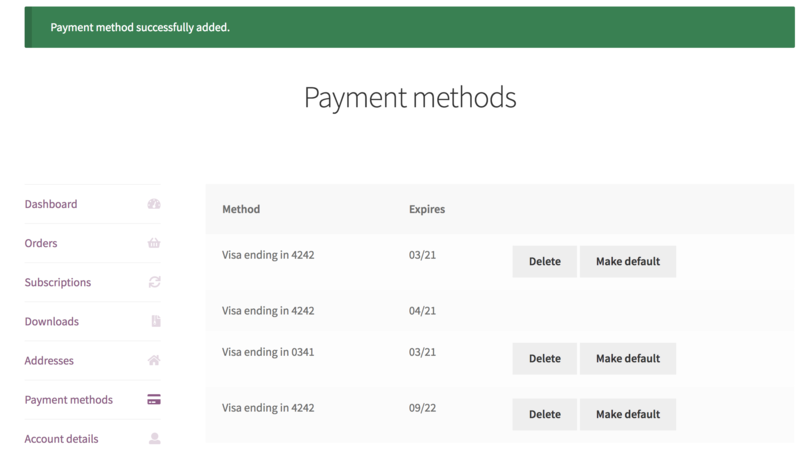 After adding a new payment method, a customer may wish to then set this method as the default. For example, perhaps the old payment method has expired and they would like to add a new payment method for both existing and future subscriptions. 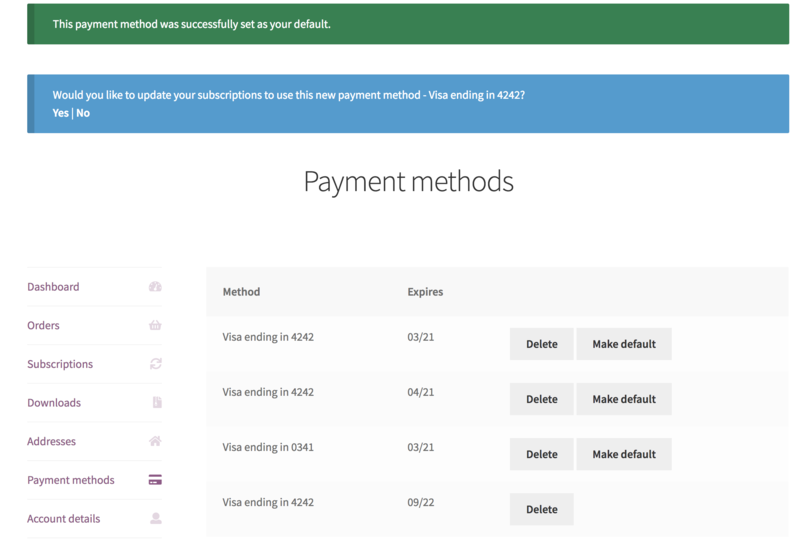 When a new payment method is added and set as default, an option will appear to update all the customer’s existing subscriptions to use that method. Choosing “Yes” will cause the payment method for the customer’s existing subscriptions to change to this new default. This will only occur for subscriptions using a payment method that supports payment method changes. On the subscriptions, an order note will appear to record this change. If a customer would like to renew their subscription without waiting for the next payment date, that is now possible with the Early Renewal feature. After an early renewal is processed, the next payment date is extended to accommodate another billing period. For example, if a subscription renews monthly on the 15th and the next payment date is December 15th, then processing an early renewal on November 20th will move the next payment date to January 15th. More information about this feature can be found in the Subscription Early Renewal Guide.